What is arguably one of the most compellingly beautiful urban parks in the world is currently under siege by the very city government that is supposed to protect it. Two large areas of the park are hidden by opaque fences which discourage passersby from seeing what is taking place behind them [Fig. 1]. Only one of the two sites (see A and B below) has the legally required billboard describing what the activity behind the fence is about. Apart from these intrusions, the villa suffers from the annual occupation of its central area by a series of for-profit or non-public events which, including setting up and clearing away, lasts for three months, May through July [Figs. 2-5]. These events could and should be held elsewhere. 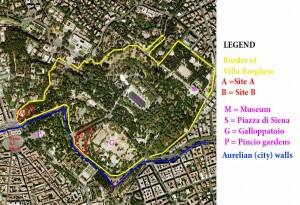 Instead of the yearly fencing off of the extensive Piazza di Siena area, a dedicated “Eventarium” could be built over the under-used two-story car-park in a corner of the villa itself, the Galloppatoio [Fig. 6]. This section of the park did not become part of the villa until the late 19th century, and is therefore not as critical as the more historic part of the villa. The use of this space would avoid the inevitable damage to, and loss of public use of Piazza di Siena [Fig. 2], the heart of the 17th century villa, during Spring and early summer when it should be enjoyed by all, and not just by a chosen few. 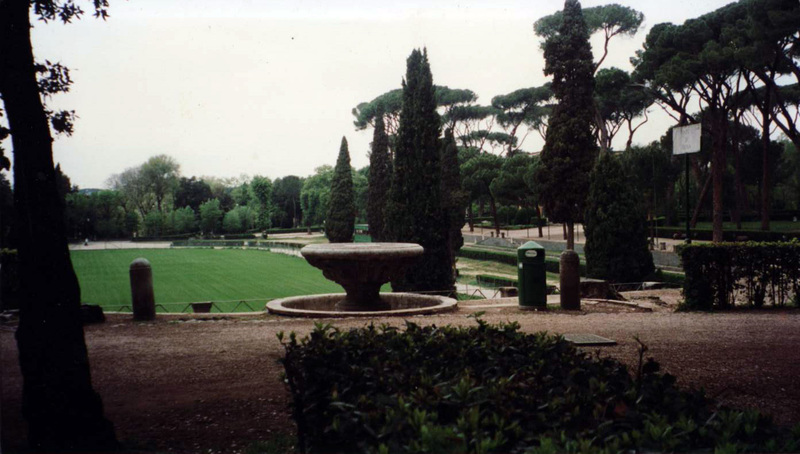 Villa Borghese has had a threatened existence before now. In the late 19th century the Borghese family decided to emulate the Ludovisi who had recently sold off their villa in subdivided lots to building speculators cashing in on the rapid increase of Rome’s population due to its new position as capital of unified Italy. 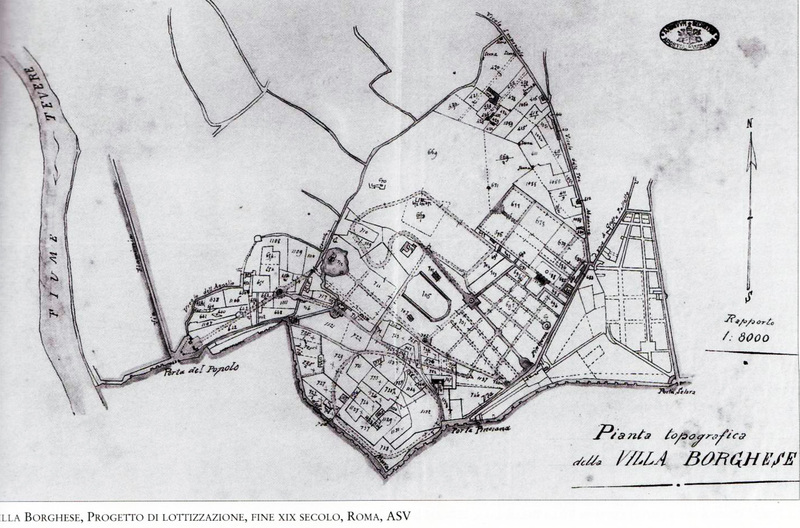 Villa Ludovisi, now the Via Veneto neighborhood, was on the other side of the Aurelian walls from Villa Borghese. 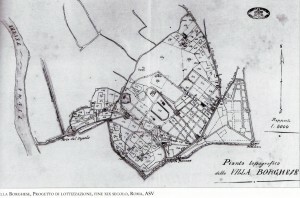 A plan for similarly subdividing their own villa was drawn up by the Borghese [Fig. 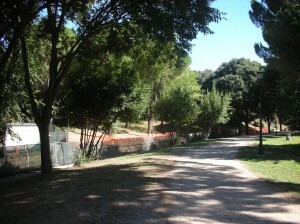 7], and only the timely expropriation by the government saved Rome’s most enchanting park for public use. 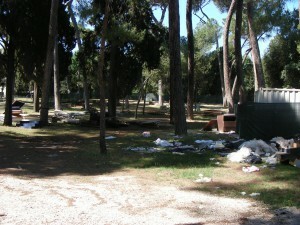 But public land has continually been under attack by private speculation in Rome, and Villa Borghese is no exception. Near Porta Pinciana the Casina delle Rose, a former cow stable turned into a bar in the late 19th century, was illegally doubled in volume in the early 1960s, so the city government shut it down and fenced it off. It remained a sad, abandoned wreck until this century when demolition of the illegal addition and restoration of the original building was undertaken. In the 1960s the Galloppatoio was dug up to build the two-story parking garage mentioned above. Despite being covered over with soil the result is a desolate looking corner of the park. More recently, the Pincio gardens in the angle inside the Aurelian walls, and attached to Villa Borghese by a bridge in 1908, was well along in the process of being dug up to build a seven-story parking garage in 2008. This effort, designed to make money for a private firm, was finally interrupted by a determined effort on the part of a group of citizens and by politics due to a serendipitous change in the city government (see The Embattled Pincio). 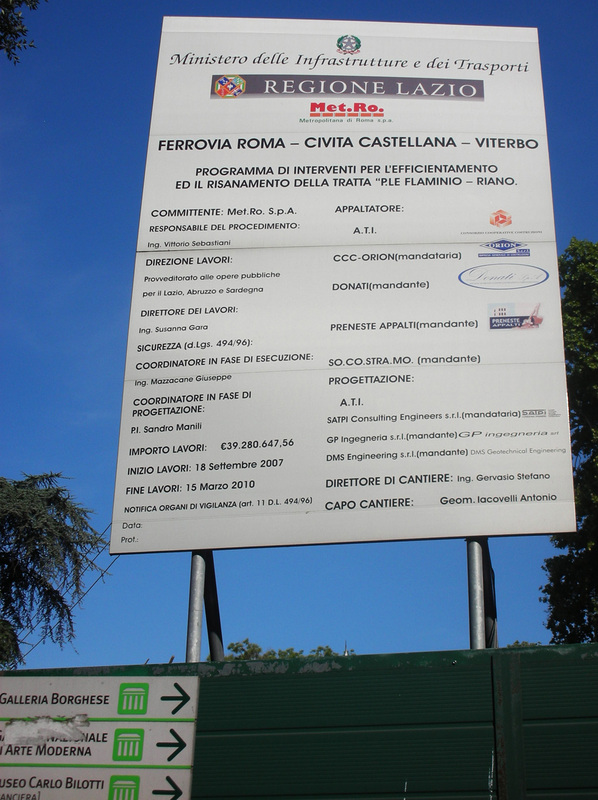 The same city government is now allowing two unannounced projects in Villa Borghese to proceed however. The areas involved are delineated on the Google map of the villa (A and B in Fig. 1). A. The site [Fig. 8] is located next to the entrance to Villa Borghese from Piazzale Flaminio near Porta del Popolo. According to the sign [Fig. 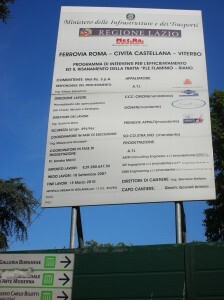 9] Metro Roma is dedicating this site to the improvement of the railroad link between the adjacent Piazzale Flaminio and town of Riano Flaminio. 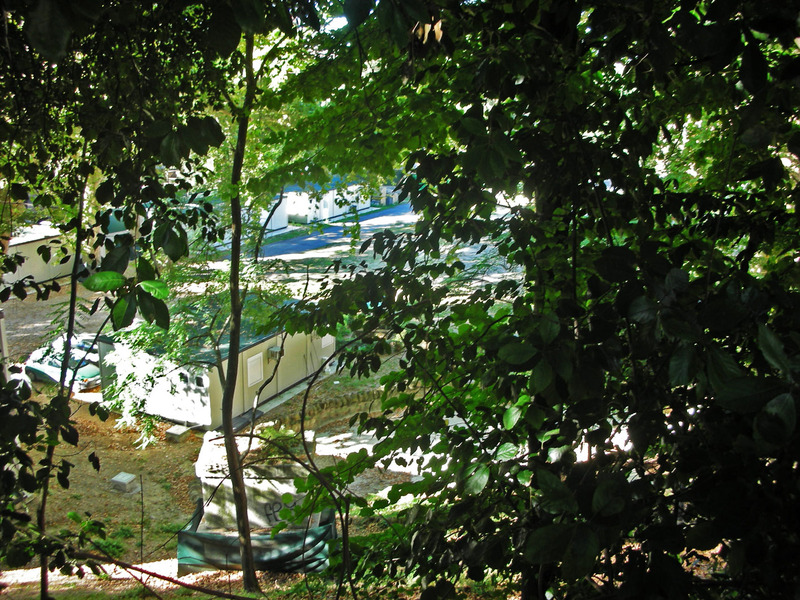 A partial view of the site appears in Figure 14, a photo taken from above, between the trees on the edge of Villa Borghese. This reveals a number of temporary buildings in an otherwise empty area. On the near edge of the site is a fountain basin, now dry. As far as the photos reveal, no excavation has begun here. B. The site [Figs. 10 & 11] is located alongside Viale delle Magnolie next to the bridge linking Villa Borghese to the Pincio Gardens. No explanatory sign informs us of the purpose of this site. A workman informed us that a “Rimessa per le Botticelle” was being built there. This translates as a Coach House. “Botticelle” is the Roman dialect for the horse carriages which circulate for hire in the city. Currently these carriages and their horses are stabled in the former slaughter house (Mattatoio) not far from Porta S. Paolo. The only sign on the fence [Fig. 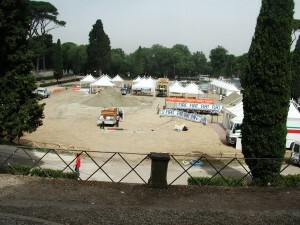 12] warns people to stay away from the excavation. This sign and the photos reveal that excavation has begun here. Unlike another great urban park, Central Park in New York City, vehicles are allowed to affect the serenity of Villa Borghese. A major road bisects the park [Fig 13]. It is a single curving street connecting Piazzale Flaminio to Porta Pinciana. Its three sections are named Viale G. Washington, Viale F. La Guardia, and Viale S. Paolo del Brasile. In theory it is reserved to buses and taxis, but in practice private automobiles use it as well. 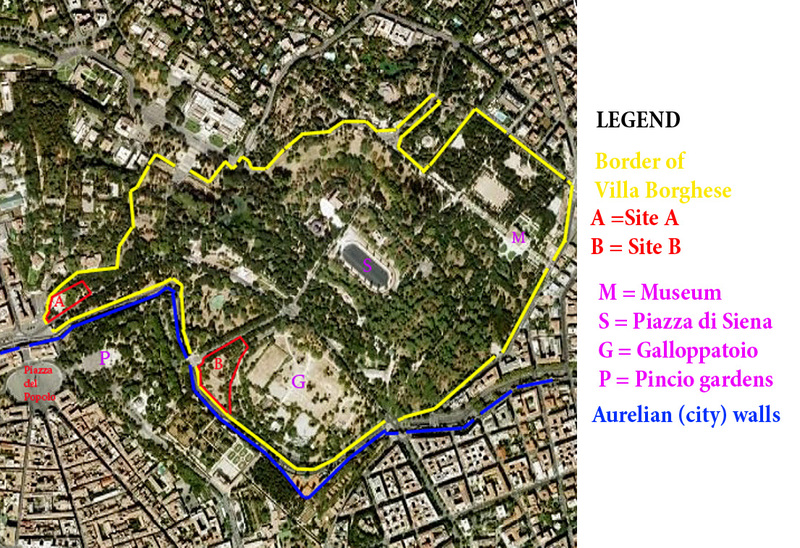 The same Piazzale Flaminio and Porta Pinciana are also connected by a four lane road which runs next to the Aurelian walls: Viale del Muro Torto. Formerly a two lane road, it was widened to four lanes in the 1970s at the expense of a strip of land along the edge of the villa. 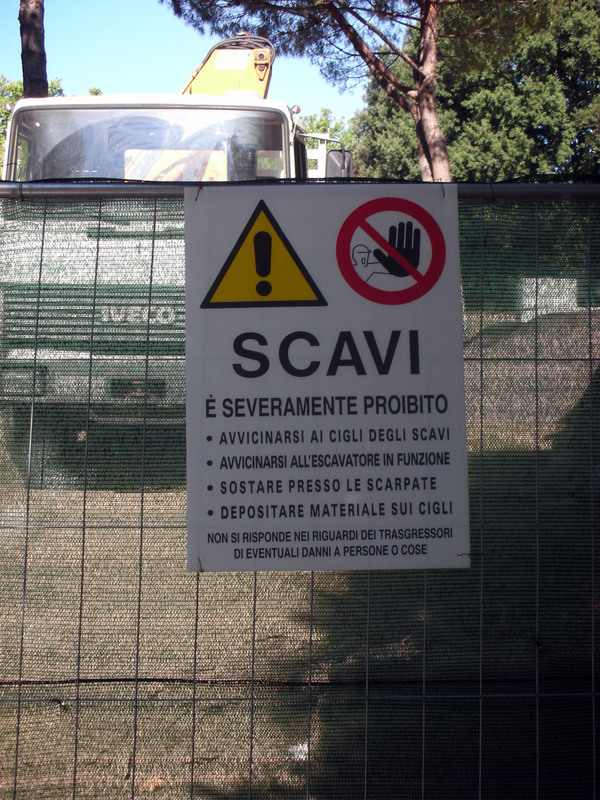 It does not require a great leap of the imagination to realize that the traffic which currently cuts through the villa really belongs on the Viale del Muro Torto. 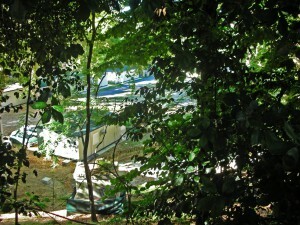 Another section of the villa is used as a parking lot. 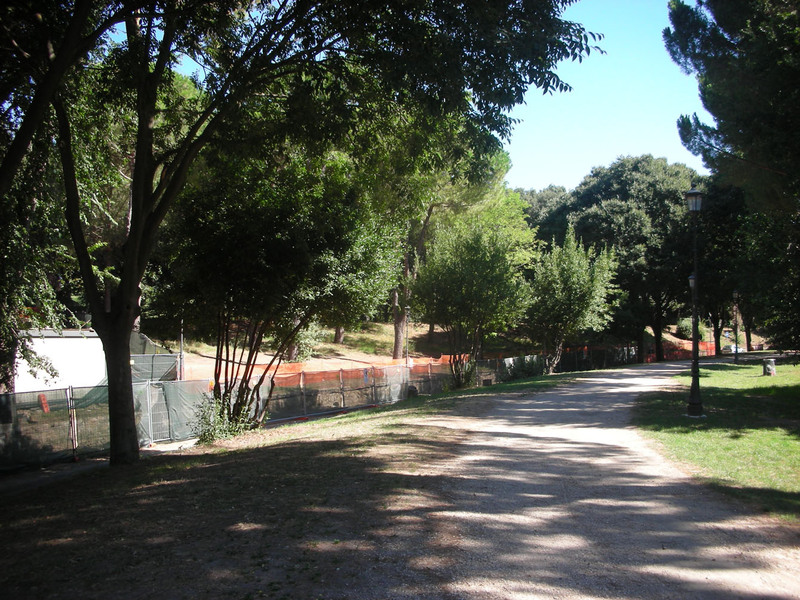 Just inside the gate to the villa from the end of Viale delle Belle Arti (near the Museo dell’Arte Moderna) is an open space named Largo Pablo Picasso which is normally lined with parked cars. 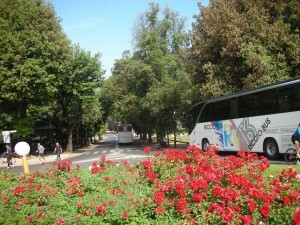 From here, more cars line the Viale del Giardino Zoologico all the way to another park gate which opens onto Viale G. Rossini. 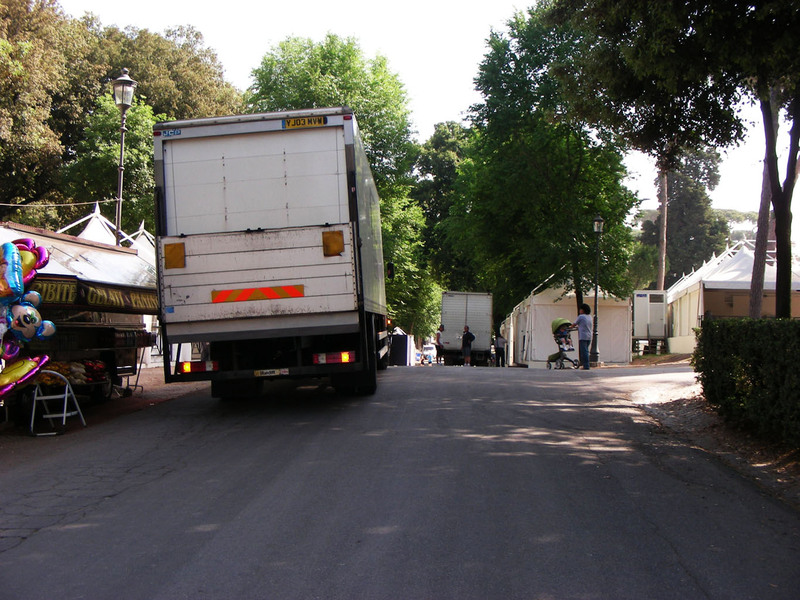 Both of the car-lined spaces are inside Villa Borghese, where it is perhaps not too extreme to suggest that cars do not belong. Both gates have both pedestrian and vehicle openings. Locking the latter would cost the city nothing and return these areas to the pedestrian visitors of the villa to whom they belong. Clearly Villa Borghese needs to have an organization that will not only look to its upkeep, but also prevent its misuse by the city government. Central Park in New York has improved immeasurably since the formation of the Central Park Conservancy some 20 years ago. A similar organization funded by both public and private sources would do the same for Rome’s most beautiful and historically important park.